Back in the heart of winter I bought some beautiful fresh oxtails from the Apple Market. I put them in the freezer because I wasn't completely sure what I wanted to do with them. After I braised them, of course. Soup or stew? Plain or fancy? Now that it's finally getting warmer, I decided I had better do something with them sooner rather than later. Given my father's predilection for the odd, cheaper cuts of meat and his experimental nature, I'm surprised oxtails never made it to our table. I was not at all familiar with them. But everyone who's had them seems to love them and I wanted to see what all the fuss was about. And I'm glad I did. It's a little work to get the meat off the bones, but it's worth it. There's a lot of fat and gristle that you have to work through, but what's left behind is full of flavor. It was especially tasty with new potatoes mashed with bleu cheese. In the end, I decided against either soup or stew. I strained the vegetables out of the braising liquid and reduced it, thickening it with a beurre manie. It made for a most elegant presentation, n'est-ce pas? 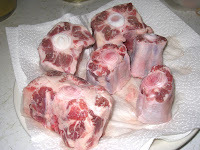 In a large pot, soak oxtails for at least one hour in cold water. Drain and pat dry. Season both sides with salt and pepper. Heat the oil over high heat in a dutch oven (or any pot that can move from stovetop to oven). When it is hot, add oxtails and sear on all sides. 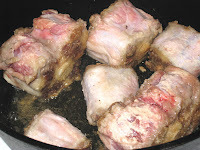 Sear the oxtails in batches if necessary; do not crowd the pan. Put them on a plate and set aside. 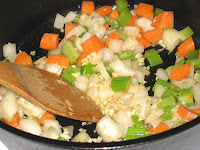 Add onion, celery and carrots to the pan (add more oil if necessary) and cook, stirring frequently, for 2 minutes. Add garlic and salt and pepper to taste and continue to cook, stirring frequently, until the vegetables are well browned - 10 to 15 minutes. Add the oxtails, nestling them into the vegetables. 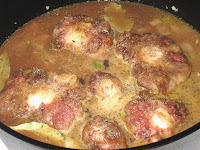 Pour in the chicken stock, the wine, and the water to cover the oxtails about 2/3 of the way. Use less water, or add more, as necessary. Add bay leaves and thyme, and more salt and pepper if desired. Cover and place in the oven. Cook for 2 to 3 hours, until the meat is falling-off-the-bone tender. Turn off the oven. 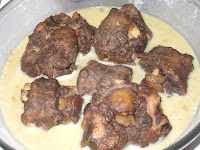 Remove the oxtails from them the pot, and put them in a dish that has a lid. Strain the liquid from the braising vegetables and pour it over the meat. Cover and put in the refrigerator overnight. When ready to serve, remove the dish from the refrigerator and remove the fat that has settled on top. (There will be a lot.) Place the liquid in a 3-quart saucepan over medium heat. 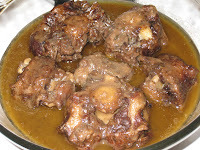 Reheat the oxtails in a 350-degree oven for 20 to 30 minutes, until hot. Combine the flour and butter into a paste, then add it gradually to the liquid in the saucepan, pea-sized bits at a time, stirring until it's thoroughly blended before adding more. Continue to cook until the sauce coats the back of a spoon when you lift it from the pot, or to your desired consistency. 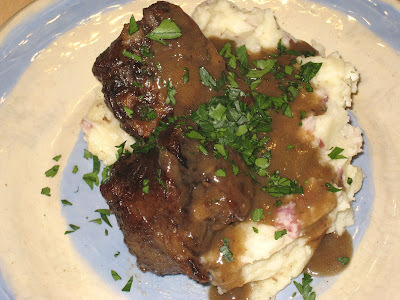 To serve, place oxtails on a mound of mashed red potatoes. Pour the gravy over the oxtails. Garnish with fresh chopped parsley. Adapted from Elise Bauer's website at simplyrecipes.com.